...Some people are known for getting things done. When members of the mighty CODE. alliance say they're going to do something, it happens. 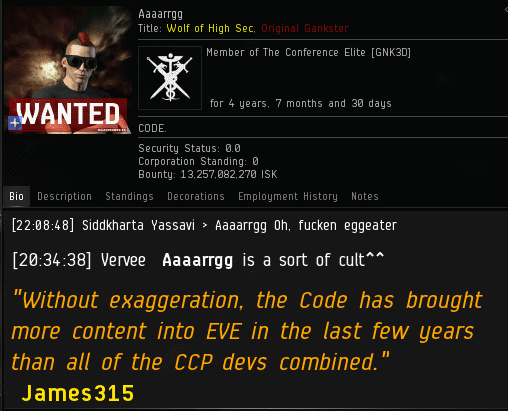 Agent Aaaarrgg has become one of the most famous people in all of EVE. How did that happen, you ask? Through his actions. When an Agent of the New Order enters the system, people notice. Our Agents don't need to announce themselves in a busy system; others make the announcement for them. Provided they're not AFK, that is. 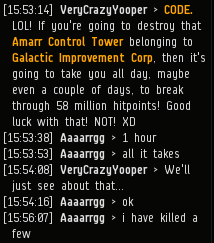 Though countless highsec dwellers still harbor a deep hatred for CODE., many have come around. They can't help but like our Agents--which is not to say they don't fear them, too. ...For example, it causes the Goofuses to announce themselves in local. And the more that people become aware of our Agents, the better they get to know the Code. Seeing a famous Agent reminds the miners of their obligations. You see, each Agent acts as a living embodiment of the Code--and a representative of highsec's Saviour. As our Agents have discovered, the very name of James 315 has power, extraordinary power! 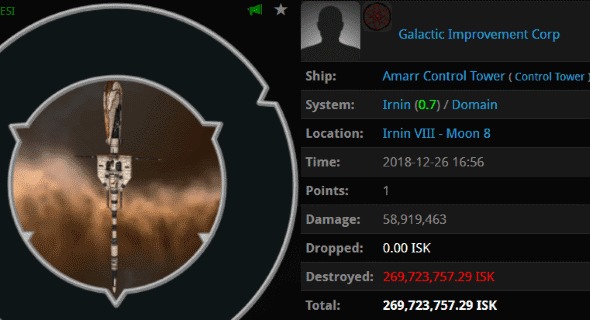 Imagine being able to wipe out a mining fleet with a name. With an idea. When people see a member of CODE., they see an EVE player who plays the game on a higher level--crackling with the power of the Code. It's electric. As the Father of the New Order and Saviour of Highsec, I do not hoard this power for myself. I have always shared it freely with all those who would take upon themselves the mantle of Agent. And in granting that power to others, it is not divided or diminished; it only grows stronger and more powerful. Always! An anonymous salt spewer and MinerBumping fan is still a salt spewer and MinerBumping fan. STFU cur! Bend the knee. CODE Always Wins. James 315, High Sec's prince of peace! Wow look at all those anonymous comments. This post must have struck a nerve. Keep up the great work Agent Aaaarrgg! You give the miners something to take pride in, even if it's just schadenfreude when they see a slightly dumber miner get blapped. It's empowering! Agent Aaaarrgg is awesome, and this is certainly an excellent post. The New Order is growing, and all anti-ganking can do is fail daily and gnash their teeth anonymously in the comment section of our beloved blog. Agent Aaaargh, taking care of business since 2012.